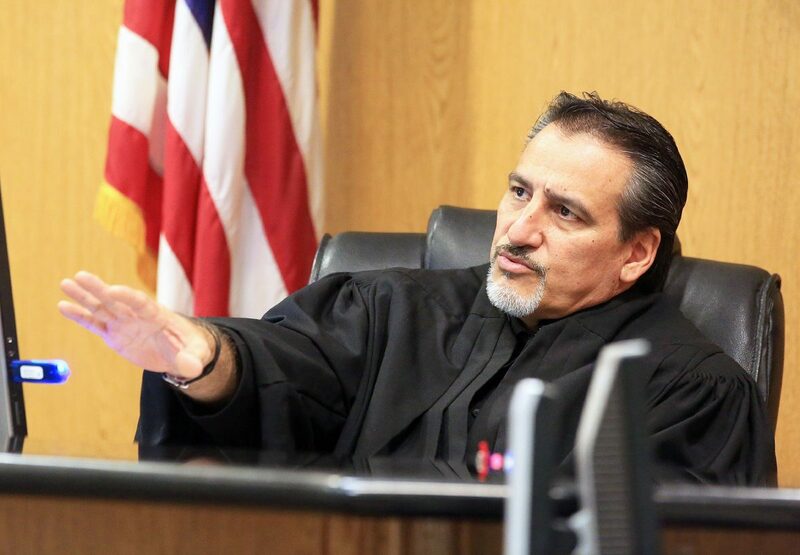 District Judge Noe Gonzalez discusses an objection from the defense lawyers outside the presence of the jury during the Monica Melissa Patterson capital murder trial Monday, October 16, 2017 in the 370th state District Court at the Hidalgo County Courthouse in Edinburg. Patterson, 50, is on trial for capital murder in the death of Martin Knell Sr., 96, in January 2015. The defendant, who was arrested in August 2015, also faces charges of theft and misapplication of a fiduciary. The prosecution has been building a case against Patterson for the last three weeks, focusing heavily on her personal finances as well as those of the victim’s, whom she is accused of killing for his estate. Before ending the day, Gonzalez called jurors — as well as those watching in the courtroom gallery — back into court to leave them with a few words. The judge, however, did not elaborate or provide any context. “The court has to make certain calls on situations that develop — sometimes it has to do with the lawyers, sometimes it has to do with certain evidence, sometimes it has to do with the jury,” he added, noting that there were still issues he had to resolve. After remarking that it has been nearly a month since the trial began, Gonzalez said the jurors’ presence for the day was not a waste of time. “I’m asking you to continue to be patient with the court, patient in this case and remember the oath that you took,” he said to the jury.